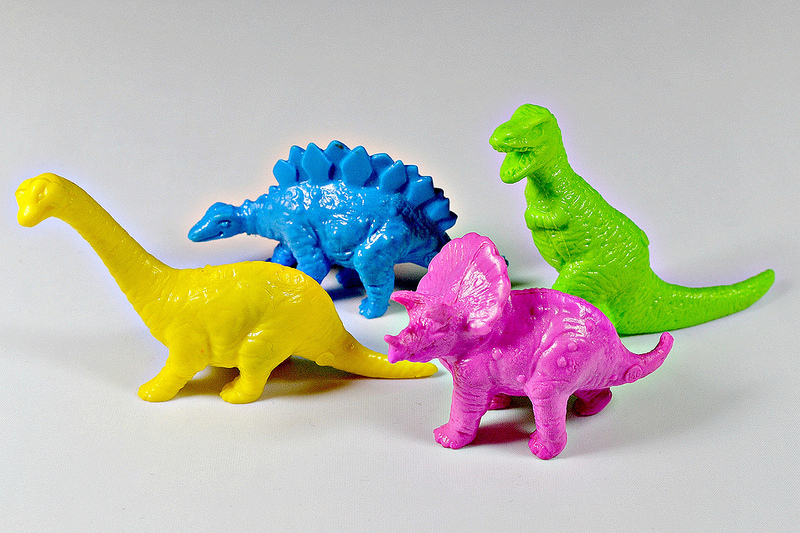 As shown in the above photo, each dino came with a trading card featuring artwork on the front and stats on the back. These figures have a few significant differences from their Monster in My Pocket series 6 dinosaur cousins. They feature unique sculpts, are made of a softer, more rubbery plastic similar to that of the first few Monster in My Pocket series (whereas series 6 dinosaurs were made of a harder plastic), and are monochromatic instead of having painted details like series 6 figures. 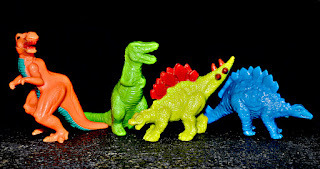 I had always assumed each sculpt was limited to one color (Brontosaurus--yellow, Stegosaurus--blue, Triceratops--magenta, Tyrannosaurus--green), but as discussed and shown in this LittleRubberGuys.com thread, some variations exist, such as a green Stegosaurus and yellow Tyrannosaurus). I remember stopping at a Hardee's as a kid while on a trip out of town with my family and getting the Tyrannosaurus and Stegosaurus figures, and being bummed that I couldn't get the others since they didn't have them and there was no Hardee's near where I lived. Personally, I think these are a lot cooler and truer to the MIMP spirit than the series 6 figures and am happy I have since been able to complete the set of four! WHERE: Offered as toy premiums in kids meals at Hardee's fast food restaurants. will you ever do a post on HOMIES? I want a set of these little anomalies.